Primal Almond Butter Pumpkin Brownies – Only 5 Ingredients! Last summer I wrote and received a grant for my kids’ co-op preschool to fund a new program promoting the consumption of fresh fruits and vegetables. The program is called “Try It Day”. Once a week, another parent or I bring in samples of a given fruit or vegetable. The kids all get a chance to try it before snack time. If they try it, or even just lick it, they get a sticker on their chart. I also prepare a one-page handout for all the parents about the fruit or vegetable of that week. I usually include recipes, food facts, and some ideas for activities. So far we’ve done cauliflower, melon, zucchini, and squash. At some point Im going to post these handouts on the site for those who might be interested. While researching information for the squash handout I came across an interesting recipe for peanut butter squash ‘brownies’. You can imagine my excitement when I realized these were primal-friendly, grain free, refined sugar free brownies! At first glance, the short ingredient list seemed really strange. There are only 5 ingredients in these flourless brownies and I couldn’t imagine what kind of texture would result. Of course, I had to make them immediately. These brownies are amazing! 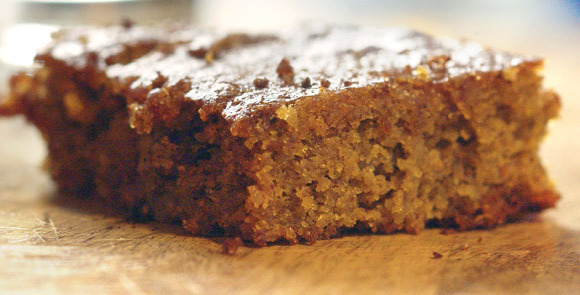 The texture is like a wonderfully moist cake or brownie and most of the sweetness comes from the squash. I cant say this about all my primal treats, but in this case you can feel confident serving these to friends, family, coworkers and children without looking like youre trying to impose some crazy health-food agenda. Compared to the original recipe I found, I increased the squash, decreased the honey, and used raw almond butter instead of peanut butter. I used 1/3 cup honey for the whole batch which comes out to just over tablespoon of honey per brownie. However, you could probably get away without adding any honey and maybe just mixing in some coconut, dates, or raisins. Feel free to get creative with substitutions. Try other nut butters, other forms of squash, other sweeteners, spices, mix-ins, the possibilities are endless. I made several batches using either fresh squash that I steamed and mashed or canned pumpkin. I preferred the fresh squash to the canned pumpkin, but the latter worked perfectly well and seemed appropriate for the upcoming holiday. Consider topping with applesauce and/or whipped cream for a delicious dessert. Who says these have to be dessert? Peanut butter, ginger, curry powder, pumpkin, and just a little honey (didn’t measure but maybe a tablespoon). They are still in the oven, but the batter was delicious! I loved this recipe! I used butternut squash and half peanut butter half almond butter for it. Making it again for thanksgiving tomorrow adding some dark chocolate chips, dried cranberries, vanilla and pumpkin pie spice this time. This is an awesome recipe to toy around with. Thank you! Absolutely LOVE this recipe….so yummy! I added dark chocolate chunks, chopped walnuts, and used agave nectar instead of honey. It’s a new thanksgiving tradition now! Thank you! Fantastic on the first time! I used organic pumpkin from Whole Foods, blue agave nectar instead of honey, half almond butter and half peanut butter and a handful of mini chips. Moist and very cake-like consistency. I will definitely make it again soon. These are absolutely wonderful! I adore pumpkin foods and finally….a recipe that’s primal and so delicious. They came out perfect the first time; so moist and rich. I added a tsp of vanilla and some pumpkin pie spice, then topped with some crushed walnuts. Can’t wait to finish the rest of the batch! Thanks for the recipe. It’s in my permanent file! Love these. I think my favorite part is how fast they are. Or maybe how fast they go! Love this!!!! I was a little hesitant about what they would taste like but these are heaven! I cannot believe how good they turned out. I made mine in mini cupcake pans and they turned out fantastic! Thank you! Thanks for the great recipe! I have shared it will all my patients. Made these last night and they are incredible! I bought a large can of pumpkin and it meant that I quadrupled the recipe. Brought some into work and no one would ever guess they were gluten free/paleo/primal. I also added vanilla extract, pumpkin pie spice, cinnamon, ground ginger and nutmeg. Thanks! I just made these – added small handful of dried cranberries and chopped pecans, cinnamon, nutmeg and vanilla, also little coconut flour, cooked about 30 minutes – hope I don’t eat them all tonight, they are wonderful! Thanks! I have read several just right stuff here. Certainly price bookmarking for revisiting. I wonder how much effort you set to create one of these excellent informative web site. These were DELICIOUS! I could not believe the texture they were… just like a moist cakey brownie, but with no flour?? I did add just a touch of vanilla extract and stevia in the raw, but they didn’t necessarily need it when they came out, but the vanilla did add a nice touch. I love this recipe because I feel like it’s so versatile, you can add or subsitute so many different things (different nut butters, agave nectar instead of honey, etc.) and still get that good dessert texture that feels like its bad for you… but there’s nothing bad for you in this! I’ll be making this and variations of this for a long time. Just made and devoured the first batch. These are too good. Going to make another batch with dark chocolate sprinkled on top. I made these this weekend but mine didn’t come out so well. They were moist and cake like but they didn’t seem sweet and had a real almond butter after taste.. Maybe the brand of almond butter ? Any suggestions ? I made this recipe into a cake for my wedding this weekend. It was fantastic! It was a very small wedding (12 people) so we didn’t need a big cake. I doubled the recipe, and used Delicata squash. I replaced half of the honey with a healthy squirt of liquid stevia extract (maybe the equivalent of 20 drops?) I also added vanilla, cinnamon and raisins. Baked it in a round spring form pan and served it with whipped coconut cream. Divine! Take one can coconut milk and place it upright in refrigerator for 8 hours. Cream will rise to the surface and thicken somewhat in the cold, which makes it easier to remove. Leave the paler coconut water in the can, and use it in curry or a smoothie or something. Whip the cream in a stand mixer on high for two to three minutes or until thick. It helps to chill the bowl and beaters first. I add a splash of vanilla and a few drops of liquid stevia, but you could use a little agave syrup or honey. So good! Oh yeah, I forgot to say, I used Cashew butter instead of Almond butter. It’s sweeter and more mild. I chose the Delicata for their sweetness, too. Does the recipe call for 1 cup of pumpkin? The amt of pumpkin has somehow disappeared in the recipe. I know it is 3/4cup from making it so many times but I shared the link today and folks let me know it was missing. This recipe was awesome!! I made it a few weeks ago with adding some dark chocolate chips on top and it turned out great. I’d like to make it again for Easter but have a family member who can’t have eggs. Does anyone have a suggestion to replace the egg in this recipe? Thanks! Thank you for this recipe. It’s a keeper. I used one cup of fresh pumpkin and had to bake it longer. I just saw yours posted that it should be 3/4 cup pumpkin. That will help. I used dark chocolate almond butter, agave and a little pure stevia because I figured I would want it a touch sweeter. It is deliciously. I love everyone’s variations.